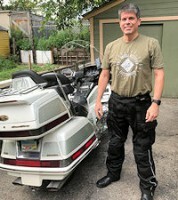 Hello, i know this isnt the place for first posts so please bare with me but have been reading learning following this forum for a bit now..i dont have a goldwing but dad has an 85 ltd that was given to him last year or so and been trying to get to run..we’re hoping to make it a project..anyhow been rooting for mr chompper to this bike sparking..anyhow have 2 questions and the first if i missed reading it i believe there are CDI boxes apart of the ignition system?! You probably did but did they get checked/tested? I have a honda transalp any they are constant known/popular problem for “no spark” troubles..been there grr... also could the ignition key cylinder have any way of causing no spark/start? I have/had a finicky cylinder that with bike on and running if i happened to bump the key inadvertently itself it has caused the motor off to switch off but lights remain on and would take a few tries to restart..and you could hear a difference in the actual sound of the motor turning iver but not firing..sounds crazy but hope it makes sense to those more knowledgeable than I... i’m new to goldwings but have had my transalp(first bike) for about 9 yrs..and am a young 48 haha..anyway wanting to contribute and help if i can... as i said been following this saga and rooting for you chompper! Checked the cdi yes and the key on switch. I can actually pull the key out once its running and itll keep running or used to anyway. Just have no idea what to do at this point besides alot of tannerite and a bomb range have fun with rifles. I do get a pulse on the green wires (capped off green wires for the reg/rec) when i hit the start button but those wires are supposed to be capped off or chopped out when you do the alt conversion and as far as i know the only discrepancy on the bike. Before you ask yes i tried grounding them but got the same result. Pulse grounded to frame still no start. That is just plain wrong, there should be nothing, no volts, no pulse at all on the ground wires. Not sure where the main ground is on that bike but I would sure check it. Thats just it all of the grounds are good. And i agree that pulse shouldnt be there. But what to do about that i have no idea. Come up with something and ill try it. Not like its gonna make the bike run worse than it does now. Ok something i hadnt thought of. The bank angle sensor! If its bad or stuck it could act like the kill switch and ground out the power from the coils which could explain the pulse at the green wires as those are the ground wires for the reg/rec. No, it just shuts off the fuel system relays. Doesn't even affect the ignition. Ok well that was my last idea. As I deduct the schematic..if the bank angle sensor trips,it kills both relays..the fuel and power to the spark units. I've been following this thread, keep at it Chompper26, I'm rootin' for ya! Please do you and us a favor and check the main harness ground, it should be on or near the front coil mounting bolt on the right side, hard to tell from the picture in the ETM. Also I see where the spark units have different color connectors, make sure the colors of the connectors match. Another very annoying question.What'd the battery voltage during cranking.Im almost positive that the computerized controlled ignition may throw up if it drops below 9.8 volts or so...Just like the 1500's do.Crank but no spark...at least on mine...I even tried it..I could still cranked the bike but no spark...battery static volts we're just above 12 volts but cratered to 9.8 when I cranked it. Sorry..just my annoying ramblings to muddy the water. Ok i opened up and physically with my own eyes traced every inch of every wire today from about 4am to just now when i finished at 6:05pm. And i can without any doubt tell you guys there is NO shorts. ALL of the grounds are clean tight and good. And NOTHING on this effing bike makes any damn sense! But all of the wires are good not a single one even singed and every one has continuity. So i dont know what to tell ya other than the bike isnt ever going to run again there is no reason for it not to start. No shorts no bad grounds all of the components are good ecu to ns sensor and everything between swapped out with known good parts even though the old ones tested good. There is NO REASON this bike is not running. I got 12.4volts on the battery (tested w voltmeter at the batt) there just isnt anything else to test/check or replace. And the bank angle sensor is good so thats not the problem either. Ok well im done working on the thing. I got a buddy coming over. Hes bringing a MC mechanic with him. They are either going to get this thing fixed or he knows a guy thats EOD and were gonna see just how big of a fireball we can make out of it. One way or another its gonna fly again either on its wheels or into pieces. I sure hope you don't mean that, someone can fix it. The only way this thing is gettin out of that is it starts running or sombody wants to pay 5k for it. Otherwise yes i absolutely do mean it. Since you're so set on destroying the bike, hurry up and do it, but post the video! I would rather it run but unless the guys can get it up on saturday. Well then ill figure out how to post the video up here. No exploding bike? Did it start running and what was wrong? Have to wait and see what they say. Rain yesterday ment my buddy picked up the bile to take to his garage. I should know something by weds one way or the other. Nope. For all i know he just stole it. I havent heard anything at all. Well good news i got my bike back and its running!!! Turns out it was this little disc on the crankshaft that has nubs on it and one of them had broken off inside the front covers. So they replaced that and it fired right up. The bike is now back together and ready to ride again. Finally up and running again. Here is the newly reborn 85 limited.